PSE is proud to support West Sound Wildlife Shelter (WSWS) this year as a Powerful Partner. Powerful Partnerships is a PSE sponsorship program which selects non-profits serving within our 6,000-mile service area. This year’s Powerful Partners are Bainbridge Youth Services and West Sound Wildlife Shelter. Our 2019 areas of focus for Powerful Partners are non-profit organizations that serve vulnerable populations, and those that work with environmental conservation. West Sound Wildlife Shelter is a wild animal medical facility that rescues, diagnoses, treats and releases wildlife. They work to promote the well-being of wildlife and their habitats through education and public involvement and outreach. Volunteers are essential to the work that West Sound Wildlife Shelter. 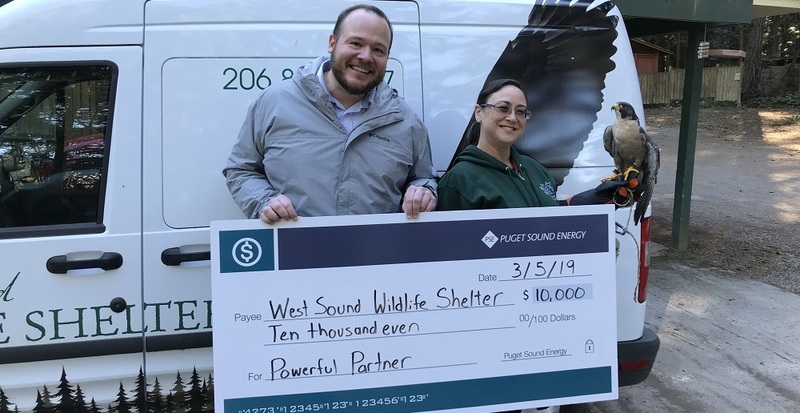 West Sound Wildlife Shelter was selected as a Powerful Partner due to their work in providing a second chance at life for injured, sick and orphaned wildlife. Visit the West Sound Wildlife Shelter website to learn more about their work, make a donation or volunteer your time.